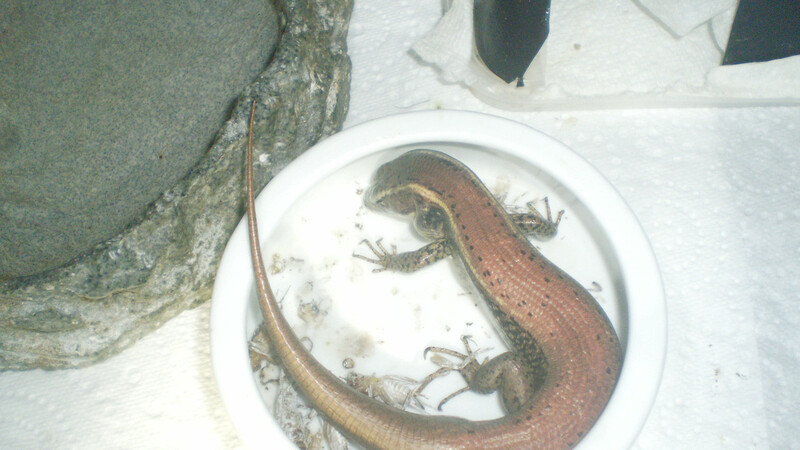 Fluffy has a new favourate food , I spoil her by snipping the heads off a couple of superworms and cutting the bodies in half, I then squeeze out the meat inside and she loves the stuff, licks my fingers clean and eats up to 4 superworms (just the meat) and a couple of medium disabled crickets per day . She loves the 100L tub too, and uses every bit of the floor space and the furniture (fake rock grotto) and loves watching us from her spaceous tank and often when luxuriating in her water dish. She's relaxed about us that she now often sleeps ontop her hide rather than inside it. 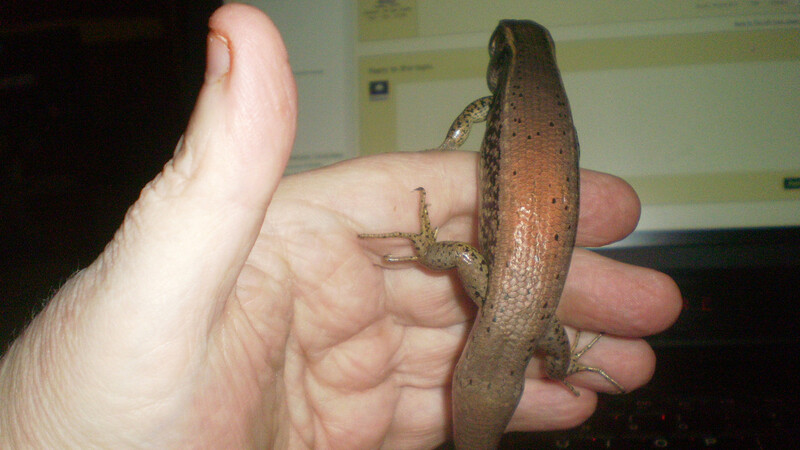 Fluffy has an admirer (another wild water skink) we call Cheakie who visits every day and really studies Fluffy and me when Fluffy is on me while I'm feeding her and letting her crawl / climb all over me (Fluffy play time) , Cheakie is I believe another girl , but bigger by about 1/3 than Fluffy and I suspect heavily pregnant (and very good on the tooth - ate 5 large crickets + a medium dead silkworm today !) . Has even started taking insects from my fingers occasionally , learnt by example by watching Fluffy that I'm "safe". 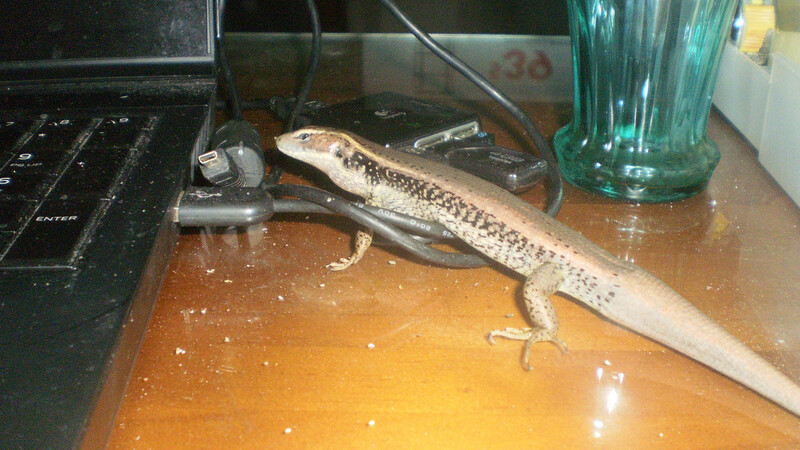 Now know for sure we have two resident wild water skinks living in the house. I was feeding Fluffy her new favourate food at lunchtime, superworm meat (she licks it off my fingers and LOVES the stuff !! and no risk of impaction as she doesn't get to eat the tough exoskeletons) and Cheakie showed up on the lounge seat next me, Cheakie loves crickets and silkworms , when I looked down to see another skink on the carpet next to foot staring up at me (this is the one who does the rounds of the house at warp speed and is a little skittish , my wife suggested naming this one who I think is also a female (and is about the same size as fluffy - so a bit smaller and lighter than Cheakie) , Speedie (as in Speedie Gonzales). Speedie lives in the laundry and does the rounds of every room in the house and likes to keep her personal space (about 2-3 ft) and loves mealworms, refused to eat any crickets until she'd had her mealworms (5 satisfied her) and then she only wanted live but disabled crickets (2 large ones today). Speedie has an original issue tail. 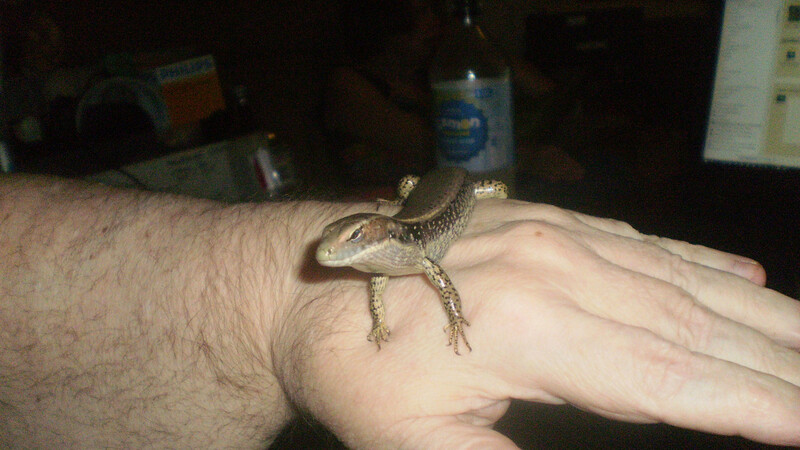 Cheakie lives in the lounge room (hangs out behind the 6 piece modular lounge and likes to nap behind the fax machine (is warm there) and is very tame , taking insects from my fingers now and visiting every day. Photos taken of Speedie and of Fluffy today. Speedie begging for more mealworms ....gimme gimme gimme ! Fluffy has finally accepted BSF lavae , .... I'd rather buy these for her and be sure she's getting the calcium she needs and less fat that to feed her superworm meat (goop) or mealworm lavae or pupae meat (goop) or cricket meat (goop) , she's very lazy , has me worked out and knows I'll decapitate the bugs and squeeze the meat eat to let her lick it off my finger or her nose or off the end of the bug , just be sure she's getting the nutrition she needs to recover and regenerate her tail and replace the calcium she invested in the babies. I still had to snip off the nose of the maggot and then squeeze out some the goop / meat inside to get her to eat them , but she then took the rest of the maggot and ate it too which was very pleasing to see , so she had 6 BSF lavae and the meat from 1 superworm yesterday .... a very hearty meal for the little lady. And another 8 BSF lavae today. 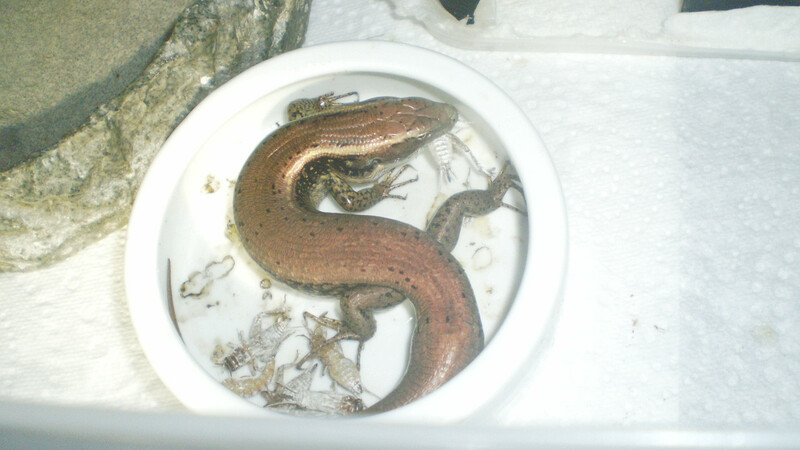 Think I'm on a winner with these BSF lavae for my water skinks , the wild water skinks who have been visiting . Now know there are THREE inside the house , Cheakie (who hangs out in the lounge room behind/ under the lounge , and Speedie (aka Gustzy ??) who hangs out in the laundry (under the freezer and washing machine) , and a juvenile who has been seen in bathroom and laundry. BSF lavae are a hit with Cheakie and the juvenile, Speedie wants mealworms and crickets and doesn't seem to like the smell of BSF lavae. Cheakie just paid a long visit , was a VERY HUNGRY GIRL .... she really knows how to put the food away = 6 medium crickets + 8 BSF lavae (but they had to be cut open else they are YUCK !!! , cut them open and YUMMMMMM !!!). She got a shock when she headed for the sunny window to bask, Peppa was already there doing the same , she loves looking at the world outside and taking in the warmth in the sunbeams (unfortunately UV doesn't pass through soda glass as used in windows). I heard Cheakie make a very fast about turn and she back up on the lounge and peaking out from under the cushion and looking at me " OMG !!! there's a huge spiky monster there - help !!! " not that Peppa cared less that Cheakie was there as when my wife looked ( she was pancaking and her head was down and she having a siesta) - probably never even saw Cheakie , and too lazy to chase and catch her anyway. Took 4 crickets from my fingers today .... big breakthrough in the trust department. Oops ! well it smells and tastes like cricket ??? here you are , they are in that little white lid ... Cheakie making another food raid .... she's like an bottomless pit today - really hungry after being absent for a few days. Chilling watching TV with me for a while. Enough ! that flashy lightning thing is annoying !!! Cheakie having spell for eating for while .... "I'm feeling good , and it's nice to let it all just hang"
Back for a few more bugs - I had to cut the BSFL open to get her to eat them, she likes the taste of their meat , not so sure about their smell out of the tub though. This is how Fluffy slept last night , so comfortable with us now she doesn't bother hiding when she goes down for the night. In her big 100L tub last night at 3am when I went to bed. I endulged Fluffy's curiosity this afternoon. Peppa was having her mandatory mid - late afternoon siesta on her seat next to me and when I had Fluffy out for daily feed and play time she spied Peppa there and I fighting a loosing battle feed her as she was hellbent on checking out Peppa very closely, not the least bit scared of Peppa (unlike Cheakie who is bit wary of the big "scary looking spiky monster". Reminds me of how Wriggles interacted with bluetongues and the beardies (Rex & Puff) .... is a very water skink thing it seems. put herself back into her 10L tub (on coffee table), had a drink and heading into her house - bed time. Fluffy chilling on my upper arm after her big meal of 16 BSF lavae + 1 superworm and her desert of 4 mealworms. Get a load of her tail now .... I swear I can almost see it growing if I watch her long enough. And look how good her right eye is now , her left eye is just as good , and I have to look VERY HARD to see where the back and side lacerations were too , her skin has healed so well . ... I'm very proud of how she has come on over the last 2 months.She's not so keen on being handled by or on my wife , but tolerates being petted by her and really studies her when she's in the kitchen or just sitting there watching TV or reading or doing stuff on her laptop. Brumate ? me ? hell no....I'm having too much fun. Fluffy says "howdy , wat ya doen ?" sniffing out a disabled (head squashed cricket) .... YUMMM !!! If I fail to get her out she soon lets me know "she is not amused" by standing and scratching at the corner until I pay attention and comply with her wishes. Out of crickets so back to mealworms and BSFL and BSflies until the new bulk order of medium crickets arrive (tomorrow ??). She finds the worms a bit slippery , goes to bite them and they get away from her beforehand in the round worm escaper proof dish, so I have been snipping the heads off and she takes them off my shirt (chest) or from between my fingertips (handfeeding again and she's fine with that). New behavior - she was dragging a shred of paper towel around this evening , when I watched closely , she was picking up one corner between her lips and dragging it / taking it with her and napping under it .... that's something I've not seen my skinks do before , I have seen the beardies "tuck themselves in" under there hides , and push paper up to give themselves privacy , especially when juveniles. 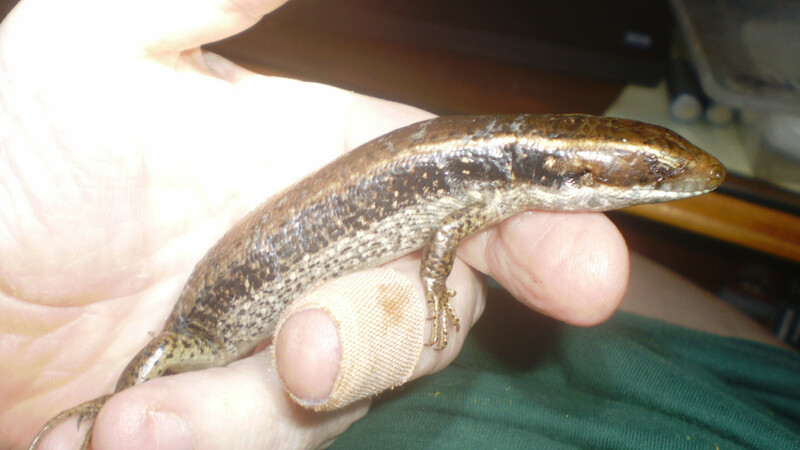 Took this photo of her ladyship Fluffy the Water Skink a few days ago..... those of you who saw her state when she was rescued and in her first month or so after will be surprised she's the same skink. 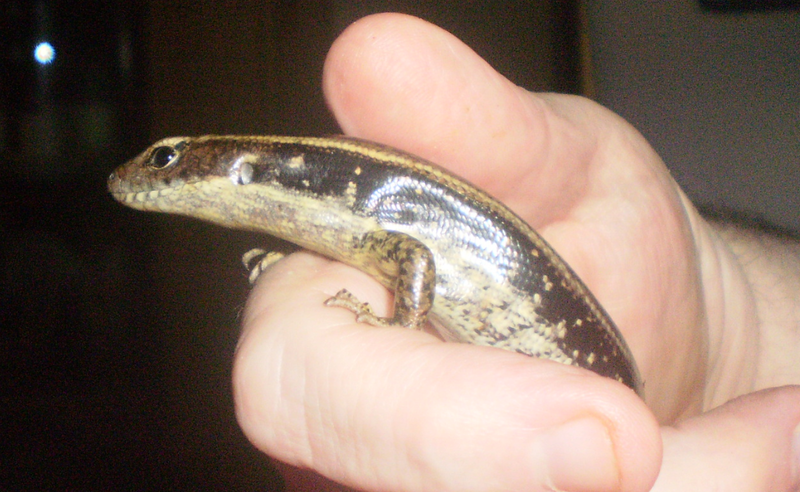 Will this skink be released outdoors where you found her or has she become a pet? Great job bringing her back to good health. 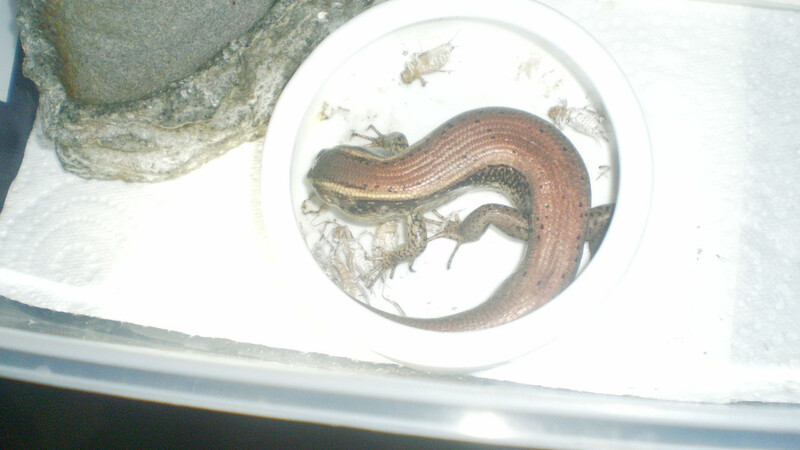 Clark wrote: Will this skink be released outdoors where you found her or has she become a pet? 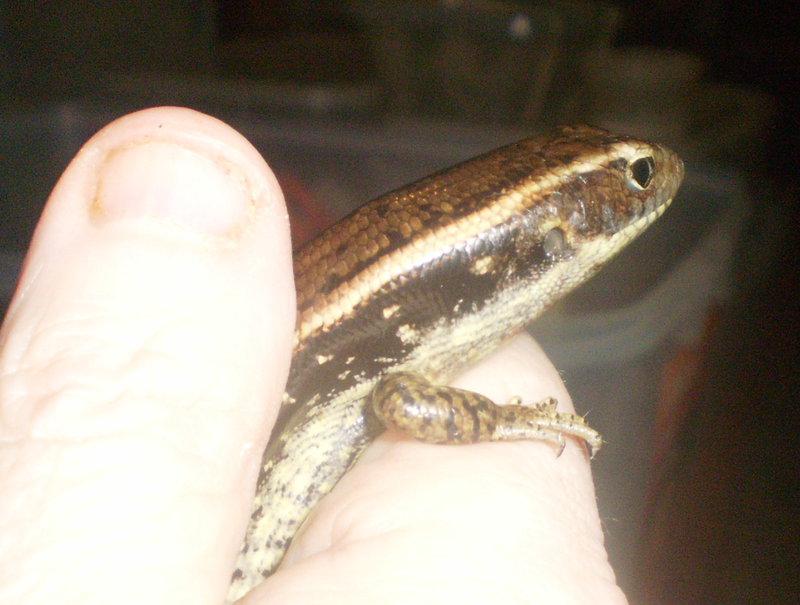 Outdoors for her (in her old territory is going to be under my house), Fluffy and I have been acquainted for at least 4 years , and she's been one of the wild skinks I regularly hand fed (wormy treats and crickets too). I have adopted her …. 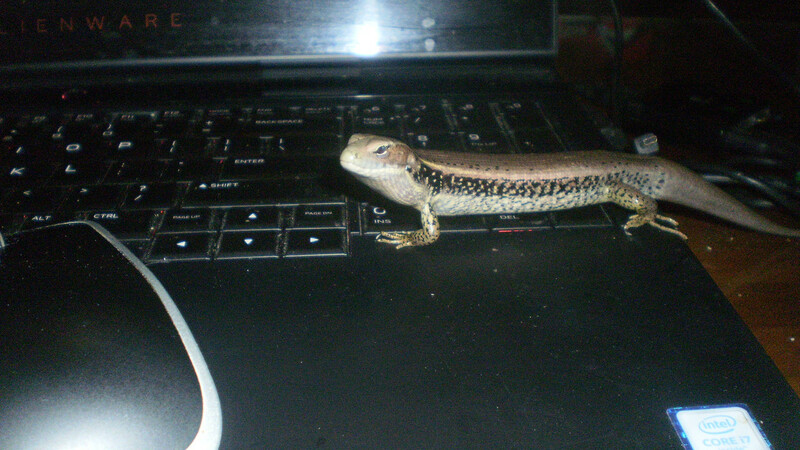 she's mega tame and super friendly and full of personality and has become a member of the family and is thriving under my care , she's my favorate pet lizard . She's mega spoilt and loves crawling all over me and the coffee table and the lounge next to me , and comes when called by name now. 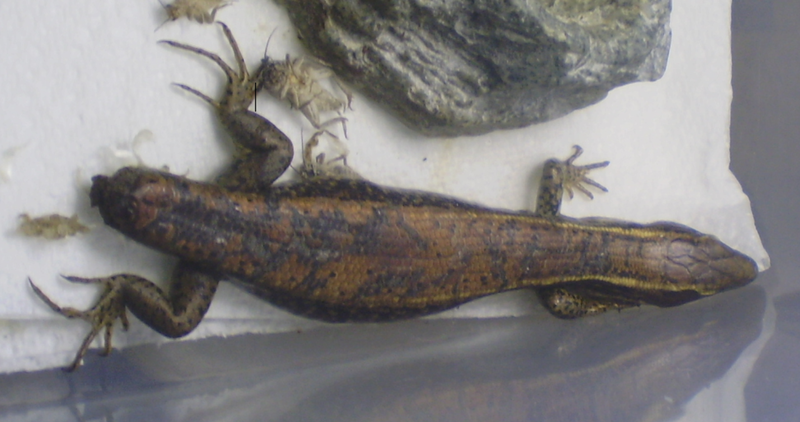 I'm hoping to find a boyfriend for her later this year even if I have to buy a juvenile and wait for him to grow a bit before introducing the pair ( there aren't very many water skinks breeders about , I only know of 2 or 3 people who are captively breeding water skinks ). I didn't expect her to see the first 24 hours out. 2 days after she was rescued and had been in my intensive care hospital / isolation tub and forced fed Critta Care by feeding tube, starting to show a little interest in freshly killed crickets. Enjoying a cuddle under my hand last night. A rare moment with her as she is a true livewire and rarely stays still for more than a few minutes …. too many strange and interesting things to investigate and explore. Never dull moment with her … she may be small , but she's got a huge personality and is full of character and super interactive. Nearly a year since Fluffy was rescued. Fluffy will have a friend sharing her tub soon …. 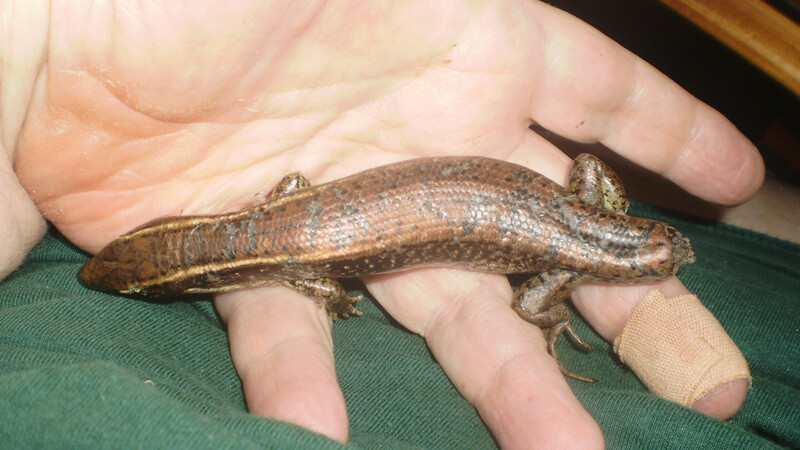 I've been on the hunt for a captive bred juvenile male eastern water skink but can't find any breeders locally (nearest are in SE Qld and SA , I don't want to ship the skink). This afternoon while I was dealing with my latest batch of 1000x medium crickets & 250x BSFL & the feeding the silkworms , I had the 30L plastic archive box sitting on the floor next to the lounge and full of crickets I'd just dumped out the calico bag they came in when I heard a loud plunk , looked down to find and regular visiting resident adult water skink who I never noticed was watching me from the lounge , had leapt off the lounge to get to the crickets. 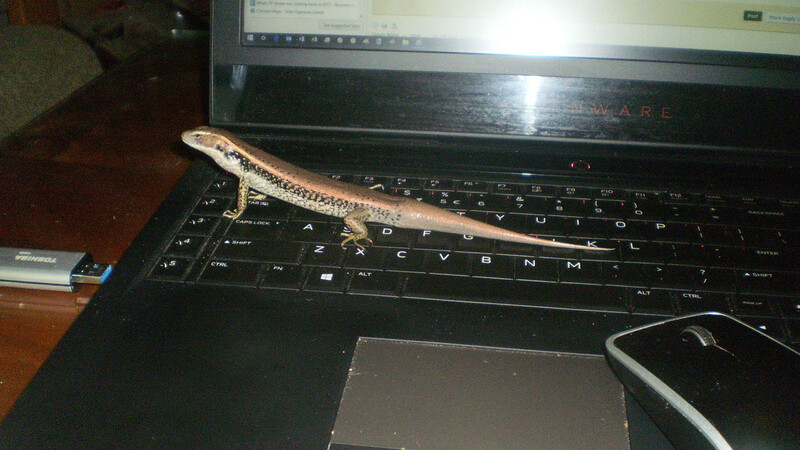 ---- thought we had a wild skink in residence for the last few weeks (as all the rogue crickets have been vanishing and I've not seen any roaches and I'd heard it behind the lounge and seen it taking a peak). 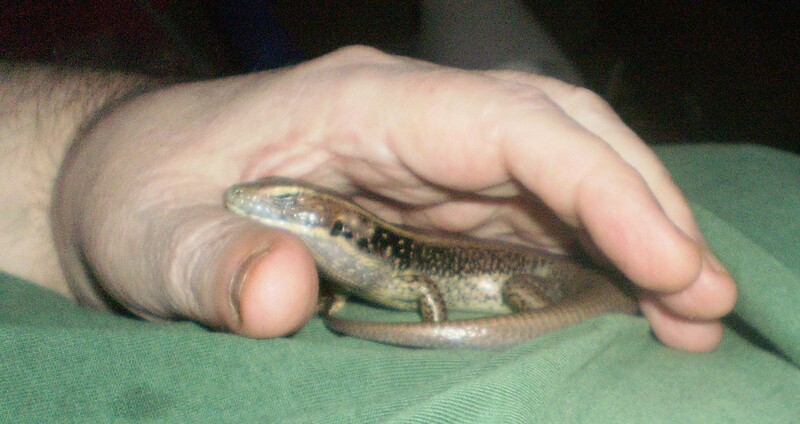 I am sure she is the same skink who has been visiting inside my house for a few years now. There she was in the tub and chasing crickets , so I took the opportunity to catch her and put her in cricket tub for while I decided if I should make a pet of her , she wasn't overly keen about being grabbed but didn't drop her tail (good sign) and settled in the tub with a feed of 6 crickets and a superworm (which were immediately dispatched killed by being bashed against the side) . Pretty sure this one is Gutzy , will verify this when I can get some closeups of the left and right sides of her body and head (they all have unique markings) and I'll be able to compare old photos and with new. Yes I am pretty sure this one is a girl , she's a little bigger than Fluffy and in very good condition , and is a sister or daughter or aunti of Fluffy's. She may be pregnant too (explains her very strong appetite). She's now installed in Fluffy's (Lucky's and Wriggle's) old 10L hospital tub and seems to have settled in OK, enjoying the waterdish and spending a lot of time soaking in her water dish , and is very curious and interested in what we have been doing and was transfixed when I was hand feeding my big beardie Peppa and the when I was giving food treats to the bluetongues George and Mildred. Thinking finishing off her taming , she's already pretty tame as I have been hand feeding her on the lounge for a few years each summer , she's going to be become a pet because the girl from next door has moved back with her baby and her dammed murderous cat (I don't to risk Gutzy having a deadly encounter) and we've seen another cat in our yard (likely hunting grrrr …. I wish i had a rifle so i could shoot it). She was still wide awake and watching TV til about 11pm , and finally retired and crashed curled up under her small HubbaHut. All my lizards love watching TV. 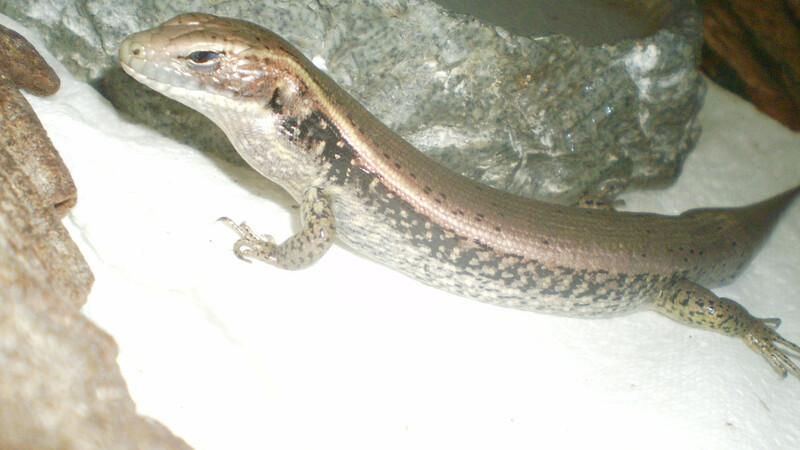 ..... Eastern Water Skinks (female) are quite communal , I often see 3 or 4 hanging out together and peaking out from under their hidey-holes all very close to each other. So I don't anticipate any dramas when Gutzy has finished her 3 month quaranteen and she joins Fluffy in Fluffy's 100L tub. Fluffy is still giving Gutzy the cold shoulder …. 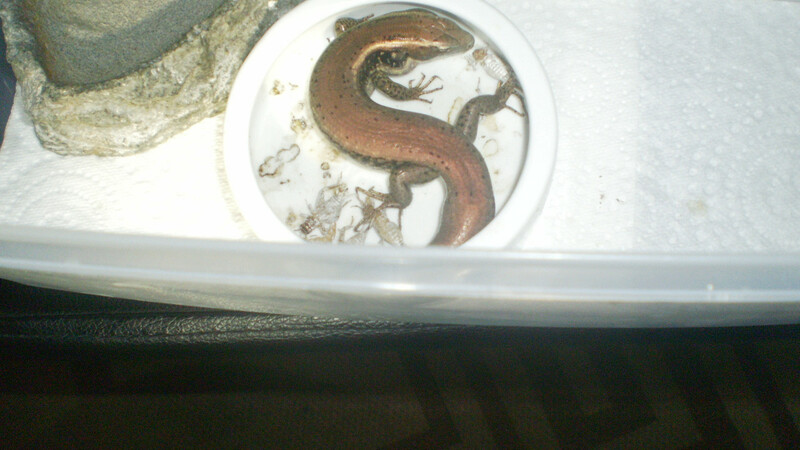 took a quick look at her when I placed her on the coffee table next to Gutzy's 10L tub, then spotted the superworm and silkworm tubs and dismissed Gutzy to go and look at the worms. Gutzy is definitely interested in Gutzy , was standing up in the corner watching her, and seemed very interested in proceedings when I was handfeeding Fluffy some nice BSFL (yes I still handfeed Fluffy a few times a week though she takes insects (crickets , beetles, worms and pupae from a feeding dish …. raids it daily). 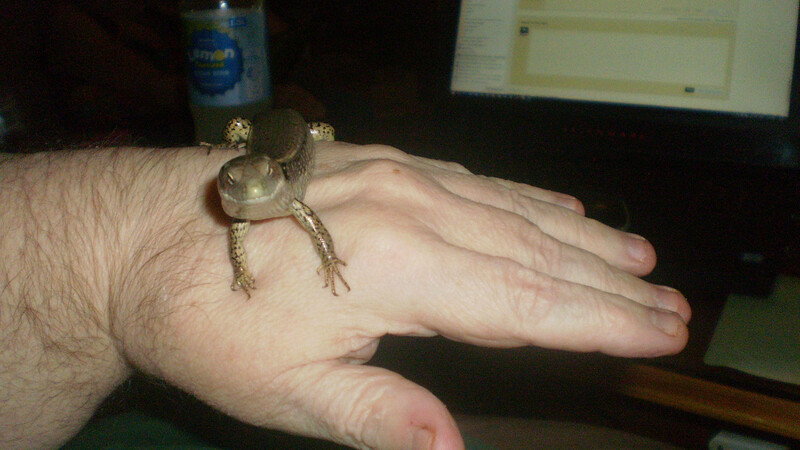 Never thought I'd manage a snuggle from Gutzy , the trick was to place her on my tummy and lift the front of my T-shirt over her for a few minutes (this seems to work very well in settling hyperactive lizards) , then I let her crawl into my left hand and she snuggled into the warm area where my arm was resting on my tummy , calmed right down (breathing slowed ==> relaxed) and even managed a 10min nap before I decided that was enough for today and returned her to her 10L hospital tub (she was not amused about this). Gutzy is not impressed with BSLF , but then Fluffy wasn't either until I started snipping the heads of the worms and squeezing some gutz out and letting Fluffy taste this (she liked the taste of the insides of BSFL).